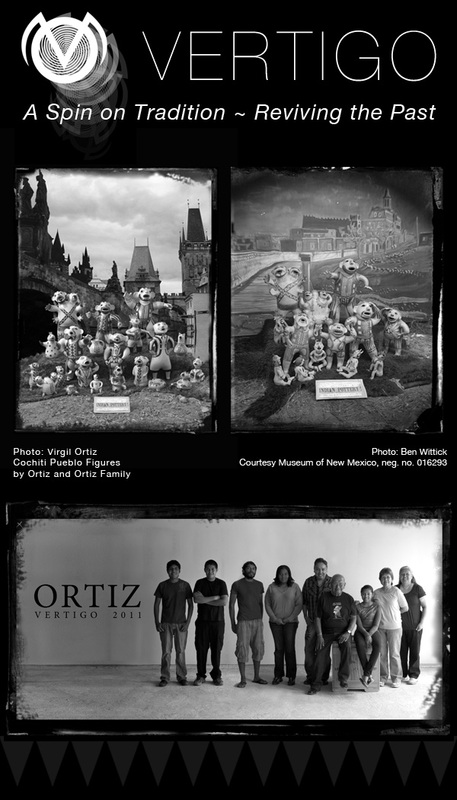 Virgil Ortiz's latest exhibit, Vertigo, opened last week at the Museum of Indian Arts and Culture in Santa Fe (just fyi, I'm no longer living in Santa Fe, and I'm crushed that I can't attend every opening! Sadtimes. BUT, since I will be in Santa Fe for their annual Indian Market, I will still get to check out the show. Awesome.). The past receives a current voice with the newest figurative work of Virgil Ortiz. 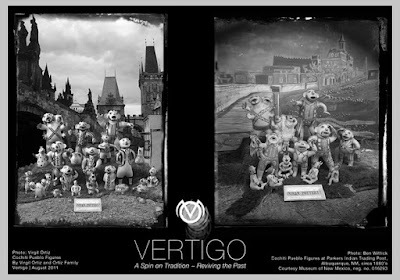 With pieces whose scale and style are both unprecedented, the Vertigo series infuses cultural understanding and historic research. Just as his ancestors used clay to comment on their lives and experiences; Ortiz does the same and adds a fresh element and spin by enlisting family members to contribute their respective works in this spectacular series. Inspired by Ben Wittick’s famous photograph, circa 1880, Ortiz recreates the scene using a photograph of the Charles Bridge he took during a visit to Prague, Czech Republic in 1999. The original Wittick photo, and Virgil Ortiz's version. ALSO: Keep your eyes open for Ortiz's collaboration with Aqua Hospitality Carpets.